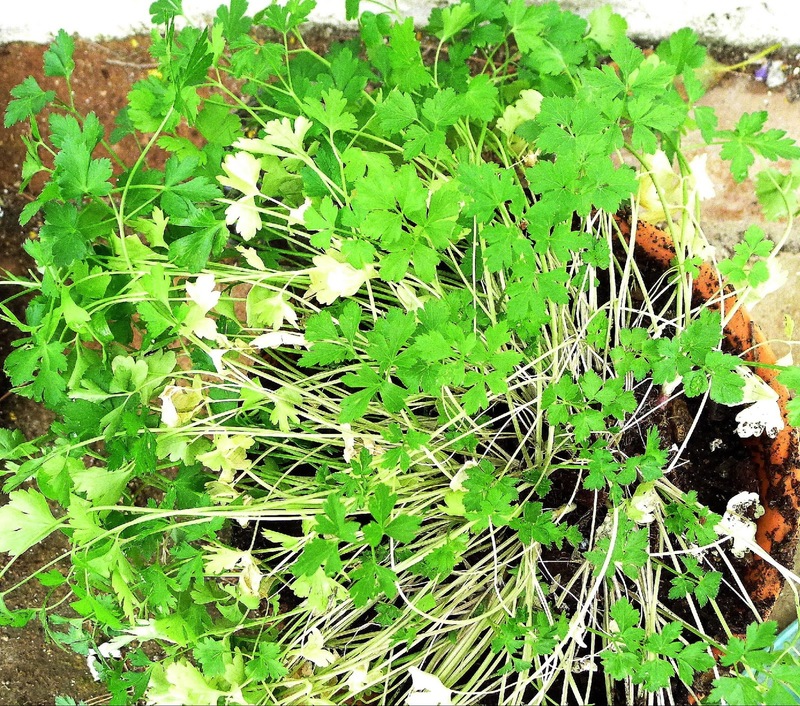 Fresh green shoots appear in the pots of parsley, mint and chives on my patio, while fronds of wild fennel pop up from the earth near the vegetable patch. Spring is springing forth! I love using fresh green herbs lavishly, in cooked dishes and in salads. Besides parsley, mint, chives and fennel, other herbs that signal springtime are dill, cilantro, tarragon, chervil, celery leaves and garlic scapes. Fresh parsley and mint--and a tiny snail in the center. 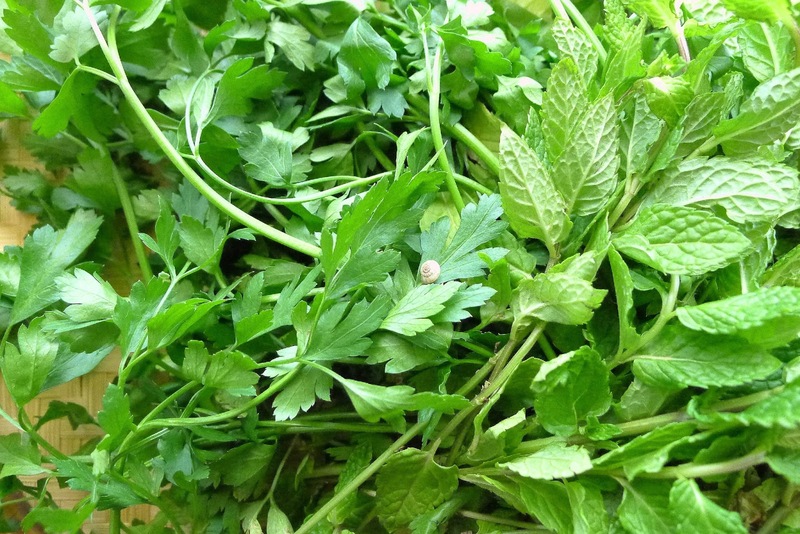 In Spanish cooking, parsley (perejil) is absolutely the favorite herb of all. At the market where I shop, a big bunch of flat-leaf parsley is often tucked in with the fruits and vegetables as a gift. It is used, not just as a verdant garnish for a finished dish, but as an important ingredient, imparting a fresh grassiness to meatballs, stews, marinades, salads, fish sauces. Herbal how-to. Wash bunches of parsley under running water. Shake off excess water, then roll it in kitchen towel and pat dry. Store the parsley in a plastic bag in the crisper drawer of fridge. Cut away stems before chopping (stems can be used for soup stock). To chop parsley, scrunch it tightly into a ball and chop. Mint can be stored in a glass of water or, unwashed, in a plastic bag in the fridge. Wash it and pat dry before using. Strip the leaves off the stems. 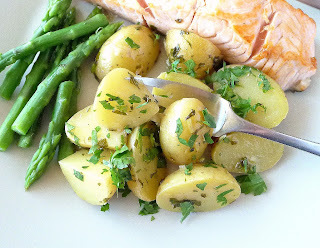 Serve the potatoes as a side dish or as a starter. 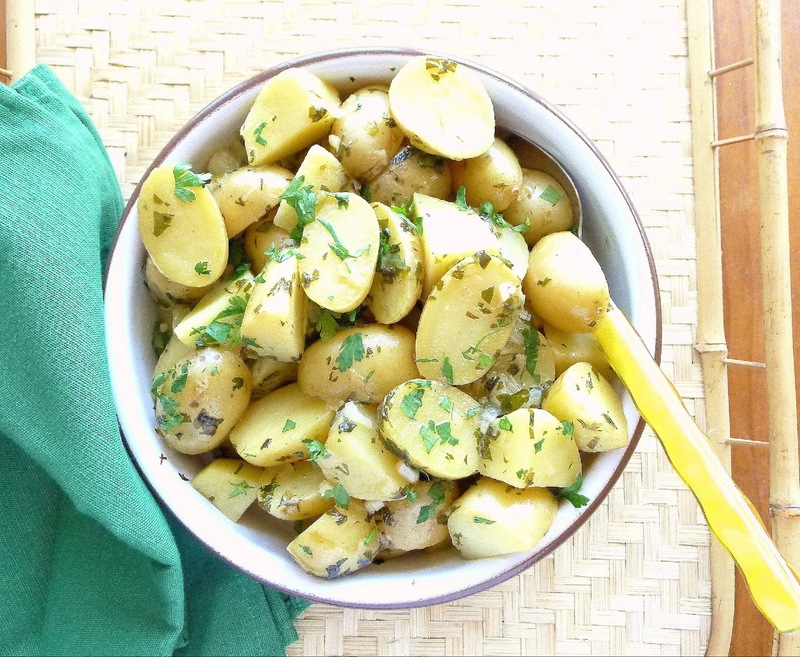 These potatoes can be served as a side dish or as a starter. As a starter, they may have chopped egg and even a few shrimp added. They are usually prepared with regular potatoes, cut in thick slices. I’ve played up the spring theme by using tiny new potatoes. Spring onions or “green” onions (cebolletas in Spanish) are immature onions along with their green tops. They’re fatter than scallions, which could be substituted. 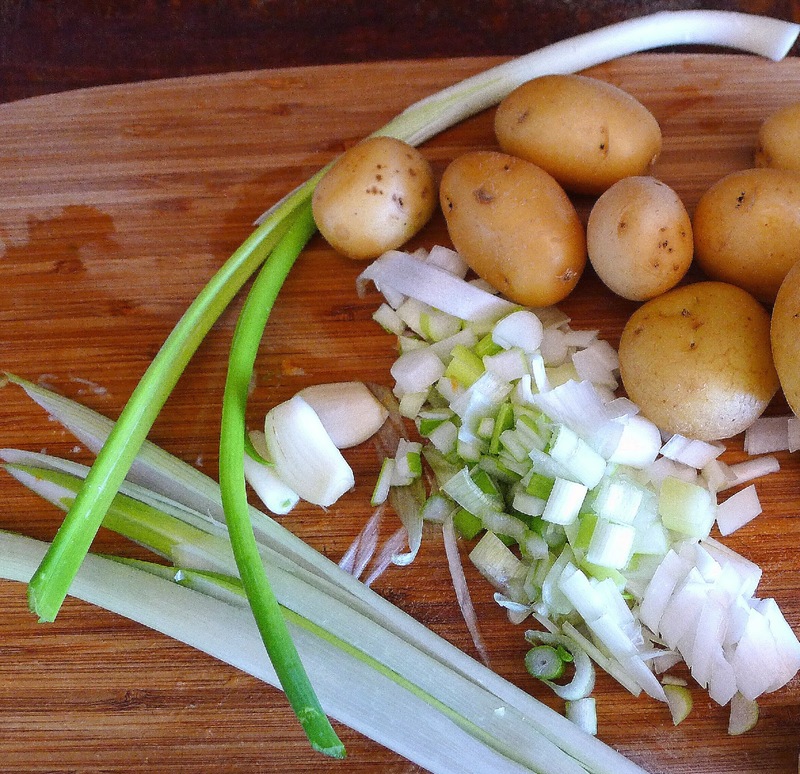 Cut the potatoes in halves or quarters. In a pan or cazuela, heat the oil and sauté the onion and garlic until softened, 3 minutes. Add the potatoes, turning them in the oil so they don’t brown. Add the water or stock and wine. 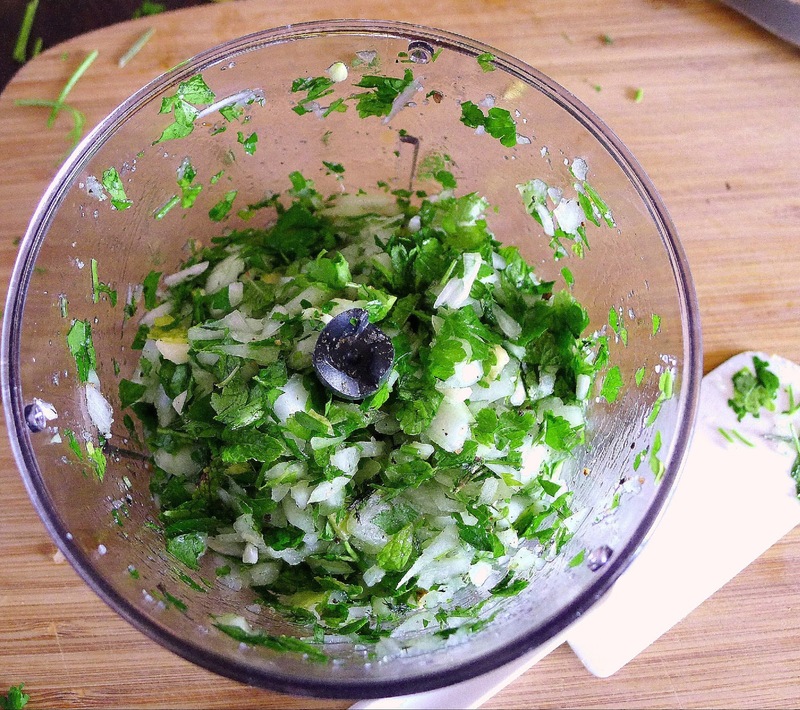 Add ½ cup of the chopped parsley. Bring to a boil, then reduce to a simmer. Season with salt (if using stock, less salt will be needed) and pepper and cook, partially covered, until the potatoes are tender, about 20 minutes. Shake the pan occasionally to prevent sticking. Garnish with remaining chopped parsley and chopped egg, if desired. 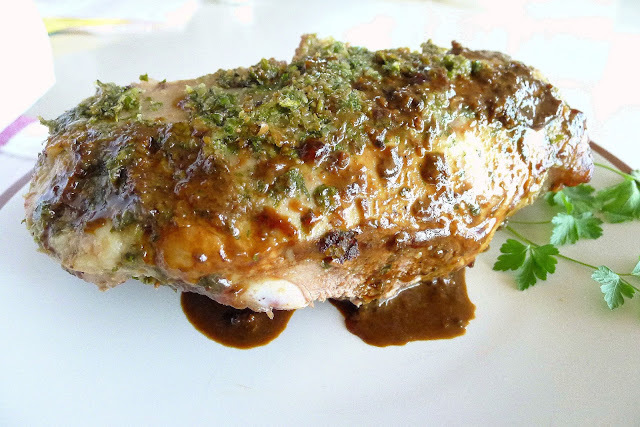 Herb marinade makes a tasty sauce for roast leg of lamb. Sliced lamb with herb sauce. 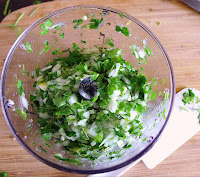 Use a mini-processor to grind together the onion, garlic, parsley, mint, fennel, rosemary, lemon zest, salt and pepper. Mix in the oil. Spread the parsley paste on all sides of the lamb. 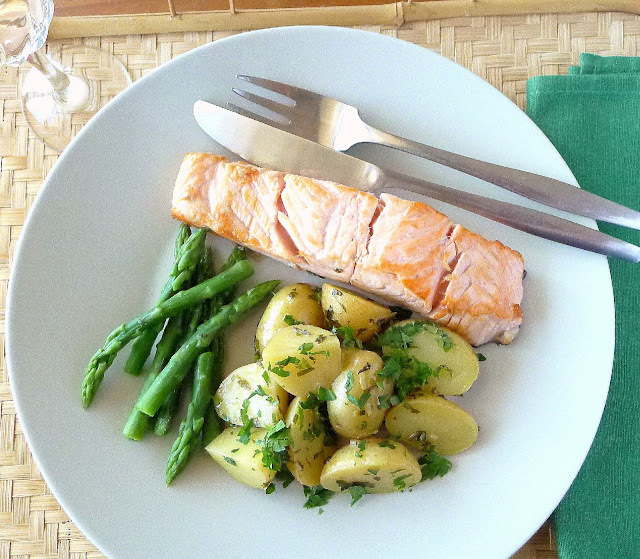 Allow to marinate, refrigerated, for up to 8 hours. 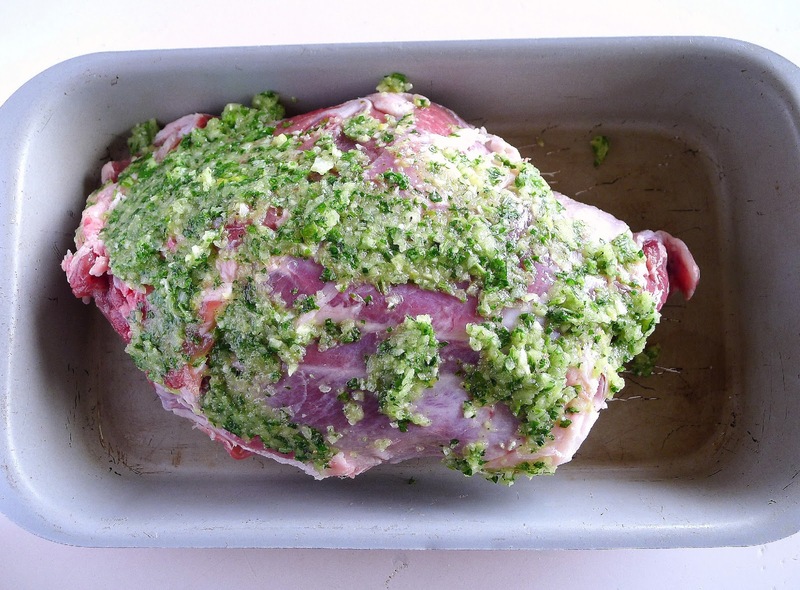 Bring the lamb to room temperature before roasting. Place it in a roasting pan. Preheat oven to 375ºF. Roast the lamb for 15 minutes. Reduce oven temperature to 325ºF. 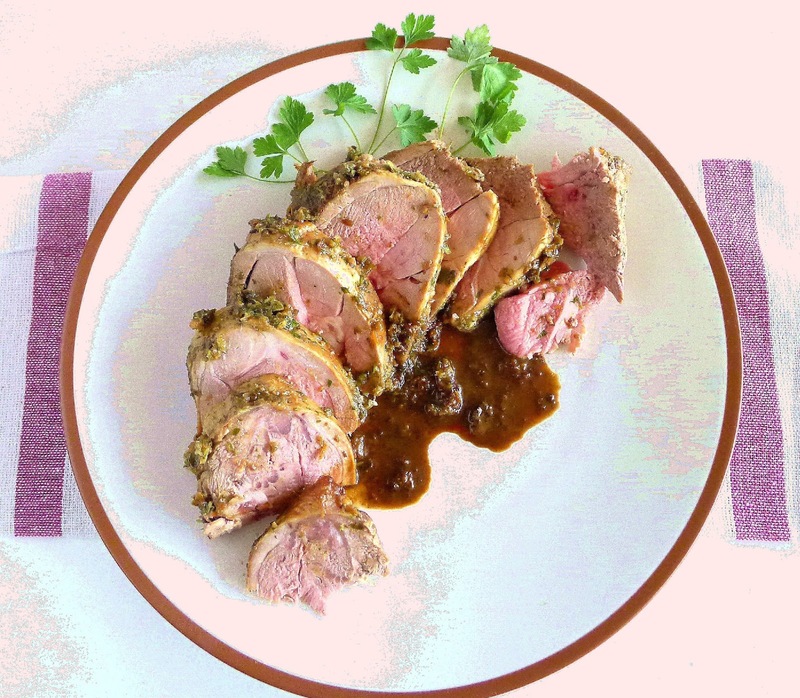 Continue roasting until lamb is medium-rare, 145ºF internal temperature, tested with an instant-read thermometer. Allow the meat to rest 10 minutes before slicing. Add a little water or stock to the roasting pan and scrape up all the drippings. Serve the sauce with the lamb. 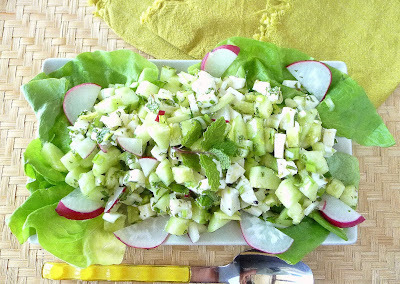 Chopped cucumber, white cheese and mint for a fresh spring salad. Queso fresco is a soft, uncured, fresh, mild-flavored cheese, usually of goat’s milk, that can be cut into dice. If not available, use feta, but use less salt in the salad. In a bowl combine the cucumber, radish, celery and scallions. Shortly before serving add the diced cheese, oil, lemon juice, salt and pepper. Add the chopped mint and mix gently. Serve with salad greens. 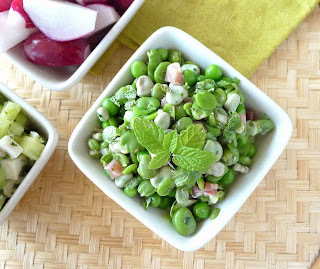 Fava beans, peas, ham and mint. Recipe is here.